Thank you to all of the planners, organizers, attendees, decorators, venue providers, chefs, cleaners, auctioneers, those that donated, tournament arrangers, card players, poster makers, slide show makers, music providers, picture takers, babysitters, beer drinkers, and anyone else having any hand in the Keep Believing Event. I would say it was wildly successful. Aside from the money raised for Angie, Gavin, and Grant, it was a night of hanging out with family, visiting with old and new friends, laughing hysterically, and celebrating into the wee hours of the night. I will be posting pictures here in the following days. If anyone has pictures they would like to share, please email them to me at vbahstork@aol.com. Just one week until the big event! If you didn't make reservations don't worry - everyone is welcome. Please come help us celebrate the extraordinary life of an extraordinary man. And a celebration it will be, with great food (BBQ pork steaks, baked beans, roasted potatoes, chicken fettuccine, pasta house salad and brownies), great drinks (kegs, specialty beers, and setups), great music (Brian's playlist) and a night of cards and hanging out with friends and family - just as Brian loved. There will be a silent auction, with some of the items up for bid including a Boat/Dinner Trip for 6, a Week's Lodging at Lake of the Ozarks, Diamond Box Cardinal Tickets, Mizzou Football Tickets, and an Autographed Ramone's CD. If you need hotel accommodations, arrangements have been made for reduced rates here. We have also made arrangements for babysitters at the celebration. If you want to see who is joining in the celebration, check the RSVP List in the right hand margin of the blog. See you at the event! Click here for driving directions to the event from the hotel. The Planners of the Keep Believing Event want to stress that the event is meant to be a Celebration of the Life of Brian. Please come help us celebrate the extraordinary life of an extraordinary man. Click on the above image to enlarge. Please note that the age limit has been clarified on the flyer to apply to the card tournaments; all ages are welcome to attend the event. 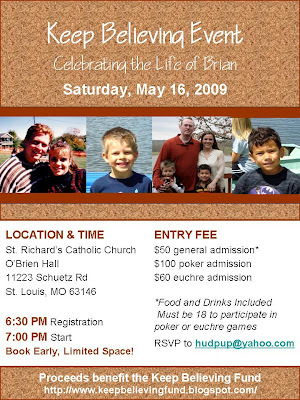 When you RSVP to hudpup@yahoo.com, please indicate how many will be attending and the type of admission for each (general, poker or euchre). 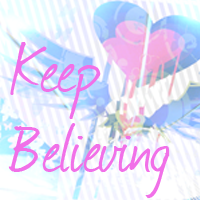 If you have donated to the Keep Believing Fund previously, please be aware that past donations will be applied to the General Admission Fee. See the RSVP list in the right-hand margin for a list of attendees. For those traveling to St. Louis from out of town, we are working on hotel arrangements near the event and hope to have details posted on this blog by April 5.